…….is one of those projects that has taken 30 years to become an overnight success. Organization began in the Spring of 2000, when Bill’s wife needed a place to park her car. Her jeep Cherokee was having to sit outside so that his British Cars could remain dry and rust-free during the wet and cold season. In defense, Kay decided her only resource was to build a separate building for the Jag, MGB, and MG Midget. That plan suddenly included a small room to have a recording studio, and the bigger room for the cars. Viola!!! The Gumball name was applied after searching for an undetermined noise that had shown up in one of our recordings, when we finally identified that the sound on a track was a gumball from a tree outside, rolling down our metal roof, before being fully insulated! The prior 30 years for founder Bill (Billy) Weir, starts at Humes High School, Memphis, Tennessee. It was about the same time that another Humes student, Elvis, was also beginning his career. Bill’s career had an unusual jump start when a young Rock-n-Roller, Harold Jenkins better known to you as Conway Twitty, from Helena, Arkansas, asks Bill to play drums for him, becoming one of the original Rockhousers. 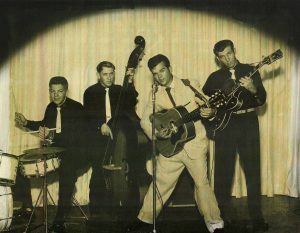 Quoting W A (Bill) Harris, “At that time he was one of the youngest professional musicians on the road.” This was Conway Twitty’s first Rock and Roll Band. Billy’s recording background begins at age 15, with many hours at Sun Records in Memphis, which included session work with notable artists, musicians, and engineers. At age 16, Bill’s experience takes him to Nashville and the Owen Bradley Studio, where he records with Conway, Jimmy “Luke” Paulman, Martin (Willy) Willis, Bob Moore and The Anita Kerr Singers on the Mercury Label, to produce all the prior hits, that sets the stage for Conway’s rise to stardom. Through the years, Bill has remained active in the music scene and has formed many valuable relationships with artists and musicians — friends that have been instrumental in helping gain the knowledge and education to stay in the music business to which he is dedicated. Billy’s friendship with Scotty Moore, in Nashville, led to his own release on the Belle Meade label, which achieved moderate success. Bill started mainly with Southern Gospel, Christian Music, and did not advertise his well hidden studio. Now with close to 10 years in the business and through long-time friends made, plus “word of mouth”, Bill has reached into virtually all genre’s of music. Christian, Christian Rock, Country, Bluegrass, Rock, Celtic, Several styles of early acoustic music, Classical, Italian Tenor, and lately Latin rock and salsa. Gumball Music is now heard through-out the world! New at the Gumball Experience, has been the addition of Jimmy “Luke” Paulman, as writer/ musician, and partner in PAULMAN AND WEIR PUBLISHING. Suddenly, Gumball, has a library of new material and is looking for artist that want to be hooked up to some exceptional “original and new” songs! And probably most obvious to our visitors is the Gumball Logo. Fred Rawlinson, also a Humes graduate, designed the now famous Logo.